In this lecture ´´Nutritional Support´´ is explained. Section one is about ‘‘Stimulants of Stress Response’’. Firstly, educator elaborates hypovolemia and end-organ hypoperfusion. Information about Tissue Damage is then given. In addition to this, light is shed on pain. Afterwards, Determinants of the Host Response to Stress are discussed. Moving onward, educator notify about body composition after which baseline nutritional status is highlighted. Lastly, discussion continues on age and gender through graphical representation. Section two is about ''Elective Surgery and Critical Care''. Educator begins by thoroughly explaining nutritional support in elective surgery. Following this, preoperative TPN is pursued. 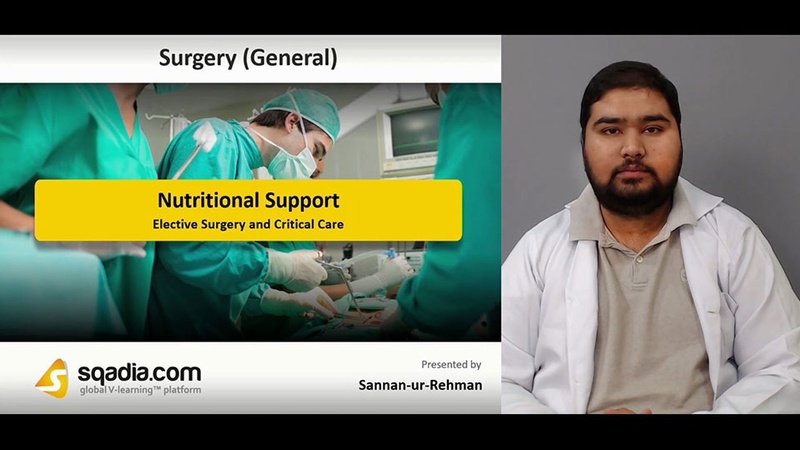 Furthermore, nutritional support in critical care comes under consideration. In the end, the educator winded up by elucidating method to estimate daily energy requirements. Section two is about ''Access Routes for Nutrition''. In the beginning, educator sheds light on enteral or parenteral. Also, total parenteral nutrition considerations are narrated. In addition to this, TPN-related complications are brought into discussion. In the end, educator concluded this part by stating the composition of a standard TPN formulation. Section four is about ''Nutritional Considerations''. The educator started off this section by speaking about enteral nutrition considerations. Alongside, enteral nutrition-related complications are also addressed. Subsequently, macro- and micronutrient selection is discussed. Moreover, concluding comments are given on access routes. Section five is about ''Additional Considerations''. Primarily, infectious processes and fever is discussed. After that respiratory failure is pursued. Then information about renal failure is given. Following this, elaboration of liver failure, and heart failure is conveyed. Moving onward, bariatric surgery is explained. Geriatric patients are considered later on. In addition to this, educator explains the concept of enterocutaneous fistulas along with short bowel syndrome and major thermal injury. Next is the elucidation of prolonged postoperative ileus. At last, acute radiation and chemotherapy enteritis is focused.